Published: Feb. 3, 2013 at 11:21 p.m. Updated: Feb. 4, 2013 at 07:50 a.m.
NEW ORLEANS -- The Baltimore Ravens' defense, pushed around for most of the second half Sunday, made a stop when it mattered most. 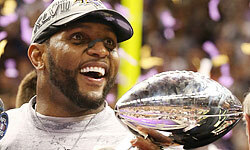 Ray Lewis is going out a Super Bowl champion. The Ravens beat the San Francisco 49ers 34-31 at the Mercedes-Benz Superdome in one of the wildest Super Bowls in memory. We saw a blown fake field goal, a power outage lasting more than 30 minutes, multiple goal-line stands, a kickoff return for a touchdown and an intentional safety. And we had a sensational performance by MVP Joe Flacco. The 49ers reached the red zone six times but scored just two touchdowns. Their inability to punch it in from inside the 10-yard line in the last couple of minutes will be talked about for years. The final sequence included a 2-yard run by LaMichael James and three straight incompletions by quarterback Colin Kaepernick on passes intended for Michael Crabtree. Niners fans will debate forever if Ravens cornerback Jimmy Smith held Crabtree on fourth down. It was a shaky non-call, but it also was a poor throw by Kaepernick and a weak route by Crabtree coming off the line. The Ravens' defense stayed aggressive until the end, sending pressure. They could not create a pass rush, but they managed to hold on. Any questions about Flacco now? He was insanely accurate and simply made throws that other quarterbacks cannot. When the 49ers' offense was rolling in the second half, the Ravens' offense responded with two long drives that ate up the clock and put points on the board. Baltimore's offensive line held up well. The 49ers' defense was supposed to be the dominant group in this game. But the Ravens' offense won their battles all night. This Ravens team came from behind against the Denver Broncos in the AFC divisional round to win in a second overtime despite giving up two special-teams touchdowns. They came from behind at halftime to beat the New England Patriots in the AFC Championship Game. And they survived an insane second-half rally during the Super Bowl to come out champions. Most teams would have been finished after giving up 17 points over a span of 4 minutes and 10 seconds in the third quarter. The Ravens responded with two long drives on offense and a last-second stop on the goal line. It doesn't have to make sense that this Ravens team was the one to break through after so many playoff appearances. NFL football rarely makes sense. That's part of the reason why we love it. By the end of this roller-coaster classic, everyone thought the 49ers were going in for a game-winning touchdown. Just like everyone thought the Ravens would lose to the Broncos and lose in Foxborough. But the Ravens' defense, the group that carried this team for so many years, finally stood tall.